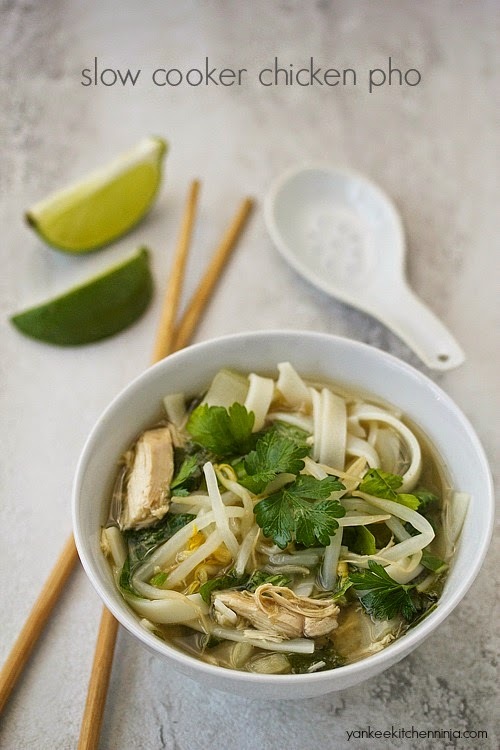 Easy spicy and aromatic chicken pho, made simply and effortlessly (and gluten-free) in the slow cooker. Just moving across town should be easy, right? No packing bags of rice in 14 pounds of packing paper to protect it as it crosses state lines, right? Well, yes and no. Yes in that things can be packed more haphazardly and quickly. No in that I AM THE PACKER AND MOVER -- and yes, I'm screaming. I'm telling you all of this because you will see the influence of the added packing and moving workload in my posts over the next few weeks: Get ready for lots of quick-and-easy dishes and treats! Starting today, with this slow cooker chicken pho. The slow cooker is going to be my new BFF during this transition, I can tell. 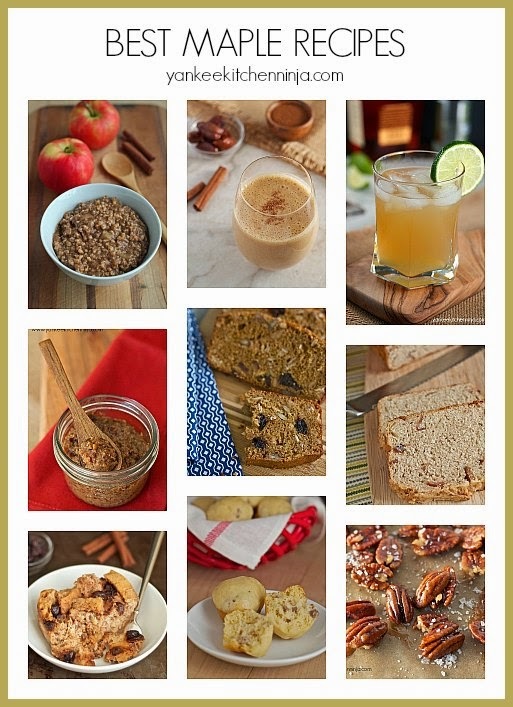 Nine delicious recipes: breads, smoothies, cocktails, breakfasts, condiments and desserts, all sweetened naturally with pure maple syrup. It's that time of year again -- yes, spring. And if you've lived in New England, you know that means it's also the time when the sap starts running and the maple sugaring season kicks into high gear. One of the ways I try to keep things healthy around here is by using natural sweeteners instead of refined sugar whenever I can. And maple syrup is one of my favorite ways to sweeten my recipes naturally. 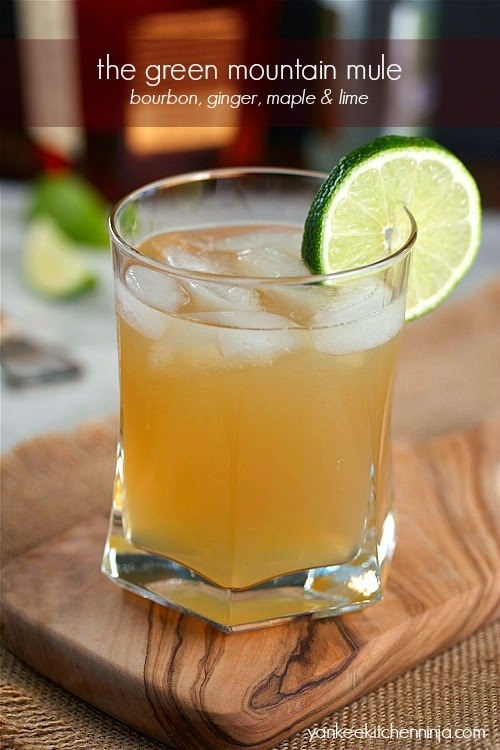 So I'm treating you to a springtime roundup of some of my favorite recipes made with 100 percent pure maple syrup to celebrate the new maple season (and please, just back away from that bottle of Aunt Jemima or I'll have to slap it out of your hands!). Lightened, easy-to-make chocolate peanut butter blondies are also gluten-free, thanks to protein-rich quinoa flour. I told you last week, in the context of my spicy Korean beef bowl, how I've become a big fan of quinoa over the past few years. One of the things I love about it is that, like many other grains, it's quite versatile; you can use it equally successfully in sweet baked goods as you can in savory suppers. In fact, quinoa flour (basically just pulverized uncooked quinoa grains) is the key to making these chocolate peanut butter blondies gluten-free. 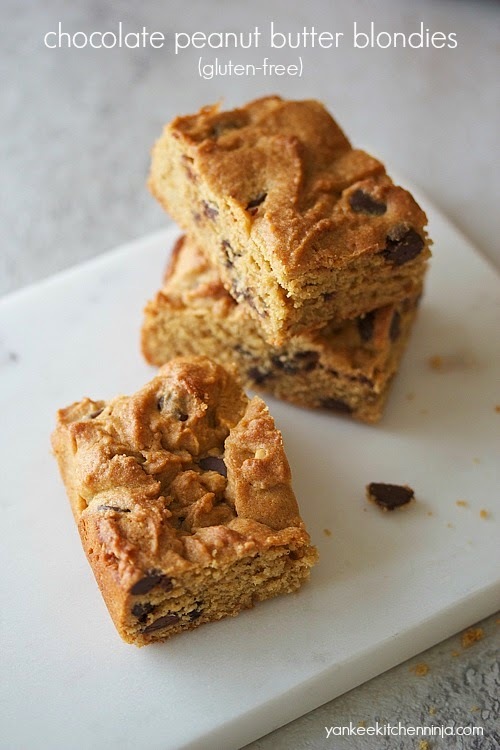 Even if you don't need to eat gluten-free, these blondies are still your friend: all of our daily diets could use the extra protein and fiber that quinoa offers. And how freakin' awesome is it that you can get it in a chocolate peanut butter blondie? Topped with tangy kimchi, this super fast spicy Korean beef bowl with quinoa and bok choy is a healthy, gluten-free riff on bibimbap. 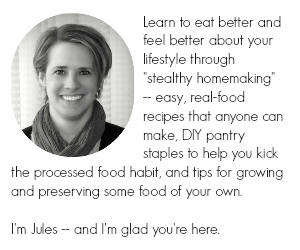 I've said it before but it bears repeating: The Ninj and this blog are all about healthy, easy recipes that anyone can make -- especially for weeknight dinners, when we all feel we don't have enough time to cook a healthy meal. This spicy Korean beef bowl, a gluten-free riff on bibimbap, is my new favorite example of just such a recipe. 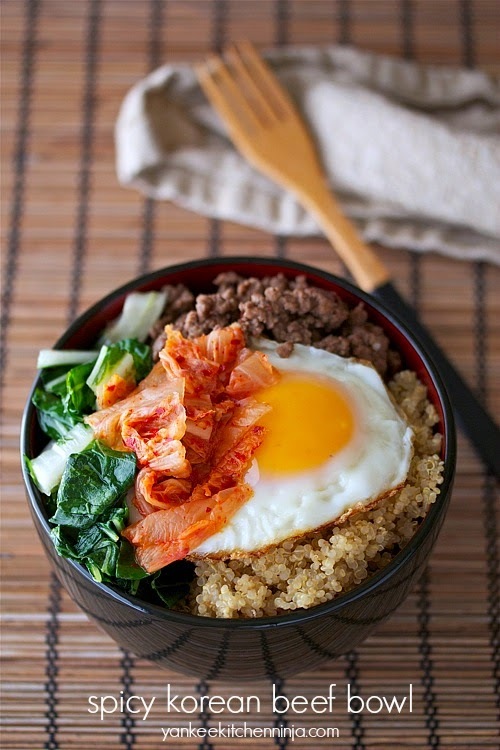 For those that aren't familiar with it, bibimbap is a traditional Korean rice bowl topped with sauteed vegetables, a spicy sauce, some meat and a fried egg, all of which is tossed together just before eating. In February, I was in New York City for a meeting. (Oh my, doesn't that sound glamorous? Trust me, my life is not glamorous, unless you call working at home in yoga pants glamorous. Besides, I was only in New York for about 24 hours and spent most of it either at the airport or in a meeting room.) While there, we ate at a restaurant called Barn Joo, a self-proclaimed "Korean-inspired gastropub" (whatever the heck that means) with a farm-to-table focus. I really enjoyed Barn Joo's bibimbap because it was served in a hot stone bowl, which made the rice slightly crispy and chewy. No-bake, low-guilt trail mix snack bars are an easy treat that can satisfy all your cravings at once: crunchy, chewy, salty and sweet. Yes, I'm a health-conscious food blogger, but I get cravings just like everyone else. 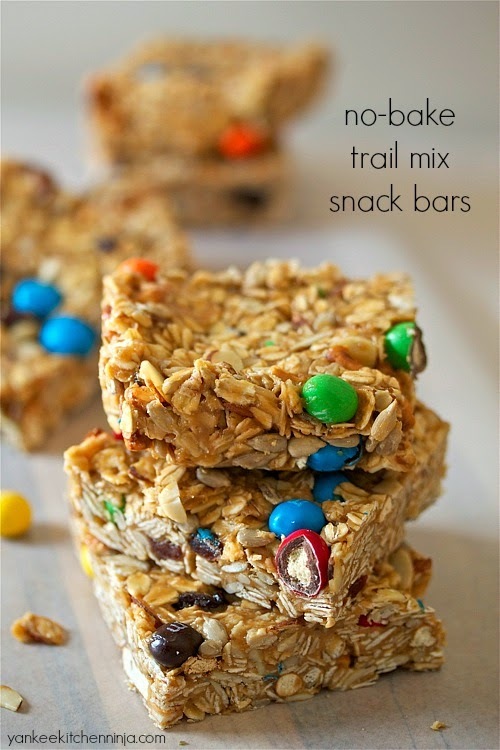 That's why I'm so excited about these no-bake trail mix snack bars: They can pretty much satisfy whatever craving you have, be it salty, sweet, crunchy or chewy. Oh, and did I mention that they're super easy to make, with no baking required? And since they're packed with oats, nuts, peanut butter, honey and other goodies, they rate low on the treat guilt-o-meter. Rich, creamy slow cooker cauliflower cashew soup is full of healthy ingredients and easy to prepare. Vegan, paleo and gluten-free. "Let's move back to the South!" Mr. Ninj said last year. "The winters will be much milder than they are in Vermont," he said. Somebody's pants are completely on fire, since I'm looking out the window at 10 inches of freshly fallen snow. Which can only mean one thing: time to break out the slow cooker. 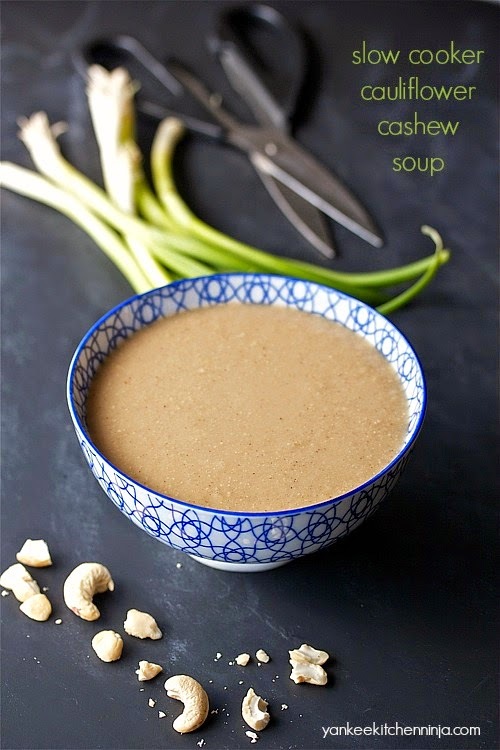 I'm excited about this slow cooker cauliflower and cashew soup because ... well ... the name kind of gives it away. It's a cauliflower soup (so yay for a meatless meal) with an extremely creamy, nutty flavor, thanks to both the cashews in the name and the almond milk that's not in the name. Baked poutine spring rolls, filled with sweet potato fries, grilled chicken and cheddar cheese, with mushroom gravy dipping sauce. Comfort food done light. Regular readers know I'm a huge fan of poutine, that Quebecois comfort-food favorite of crispy french fries smothered with rich beef gravy and melty cheese curds. Talk about comfort! But, in the same breath, I have talk about how not-so-healthy poutine can be -- which is why we don't eat it very often. Leave it to The Ninj to figure out a way to get all the comfort-food flavor of poutine in a lighter, fresher package: poutine spring rolls, filled with sweet potato fries, grilled chicken and sharp cheddar cheese and served with a mushroom gravy dipping sauce. 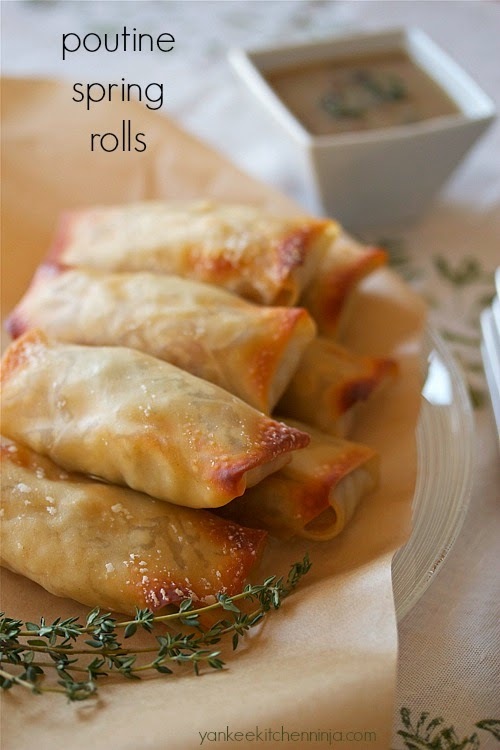 While these poutine spring rolls may look complicated and decadent, I swear they're neither. For one, they're baked, not fried, which makes them that much healthier -- as well as easy to make. Plus, I've swapped the heavy cheese curds for just a sprinkle of sharp cheddar cheese and the thick gravy for a much lighter mushroom dipping sauce. They're comfort food done light.